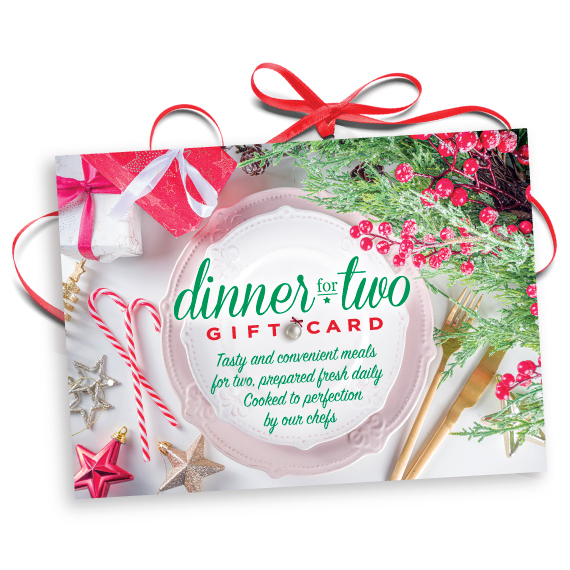 Give the gift of good eating! Send a gift certificate for our tasty, convenient Dinners for Two. Our chefs prepare dinner every weekday. Take a look at our menu to see what we are offering this month. During checkout, select "FedEx Ground" to be upgraded to U.S. Postal Service and pay just $3 for shipping and handling. Most local Saint Louis addresses will arrive within 1-2 business days. Dinner for Two comes packaged as stated on our menu. No substitutions please. Most items available in-store, à la carte. We currently offer USPS First Class Mail for gift cards, within the continental United States. We ship Monday through Friday. Please choose FedEx Ground at checkout, and your shipping type and charge will be automatically updated to USPS First Class Mail. Shipping charges are calculated per ship-to address and are based on the total cost of your order. See our Shipping Info page for rates.